I-75 Exit 141, East on FL 80 (Palm Beach Blvd.) .7 of a mile - Park is on the left. 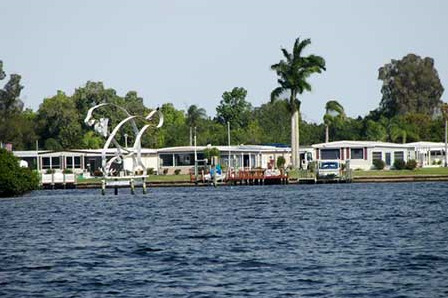 Orange Harbor Mobile Home and RV Park is a 55+ waterfront community located on the Caloosahatchee & Orange Rivers . Our waterside pavilion has a million dollar view to watch marine life in action. We’re famous for our sunsets, manatee sightings and “best catch” fishing spots, not to mention beautiful sights for boating. Our community is situated in a natural setting with beautiful untouched trees across the open water. 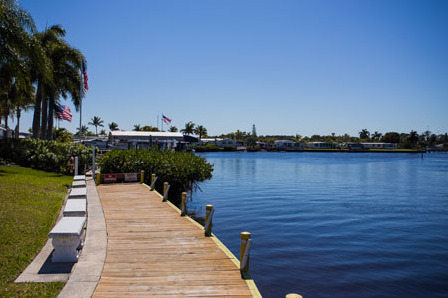 Our fishing piers and boat ramps are exclusive to Orange Harbor residents, guests and the Orange Harbor Boat Club and First Mates. You’ll have front row access to some of the best fishing in Florida. 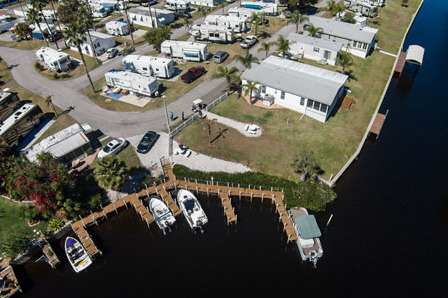 Look at one of our waterfront homes and RV sites for fishing in your own backyard. The RV Park has its own pavilion and fishing cleaning station. We also have boat slips to rent. 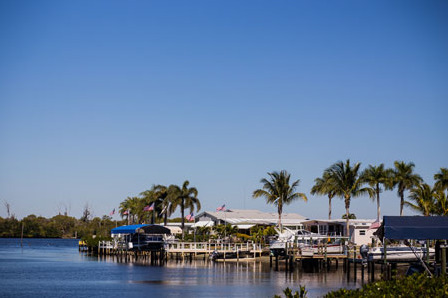 Launching right from Orange Harbor, you can explore the Orange River, Gulf of Mexico, or boat through the Intracoastal waterway to Florida’s East Coast. Florida Power & Light is just west of our community, so the water is the perfect temperature for manatees. Florida Fish & Wildlife has unlimited access to our boat ramps to launch their marine rescue equipment. We’re proud to be a small part of the wonderful work they do. 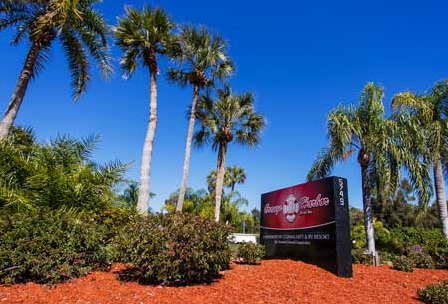 Our gated 55+ adult pet-friendly community is just .7 of a mile east of I-75 at Exit 141 (Hwy 80) Palm Beach Blvd. 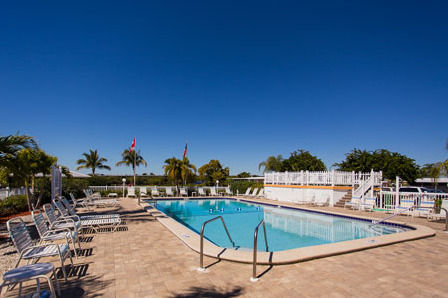 Our convenient location is just minutes from shopping venues, restaurants, Fort Myers Beach, and historic downtown Fort Myers (approximately 6 miles). 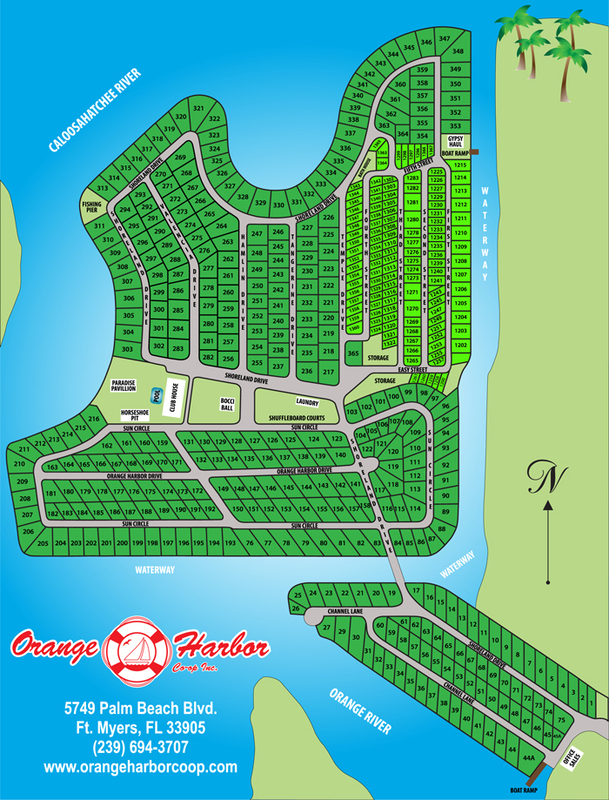 If you’re looking for great Florida camping, Orange Harbor has 127 RV sites. We have a variety of RV sites including those with extended concrete patios, new stone RV pads, waterfront, pull through sites, back-in sites and complimentary Wi-Fi. There is a restroom and shower facility as well as a laundromat available for our guests. Our friendly RV Host will accompany you to your site and answer any questions you may have. We have a heated pool, clubhouse with commercial kitchen, stage with high tech audio system, and a library filled with books, DVDs and VHS tapes for guests to borrow. 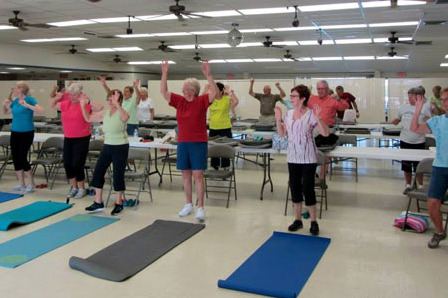 The residents here enjoy a sense of community that includes many amenities and fun activities which include pickle ball, shuffleboard, bocce ball, horseshoes, corn hole, line dancing, hobby club, and art club. Are you ready to enjoy all we have to offer? Homes are available ranging in price from under $40k to over $300k. In our resident-owned co-op community, you can purchase a lot or enjoy a standard rental agreement. 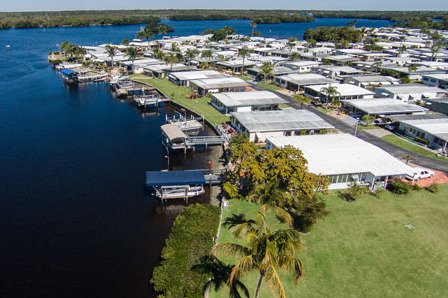 Residents have homes of all sizes from 720 to 2,000 square feet, many feature Florida rooms with water views and carports. Docks are available. We are a pet-friendly community. Your monthly fee includes trash removal, recycling, water/sewer, lawn mowing/edging and enjoyment of all amenities of the community. Our on-site sales are handled through Barefoot Realty and we have a professional full-time management and maintenance crew. Large, level and grassy sites, full hookups, laundry facilities, internet access and on-site owners are offered at this quiet community. Close to Germain Arena, Shell Factory, Sanibel Island, shopping and restaurants. 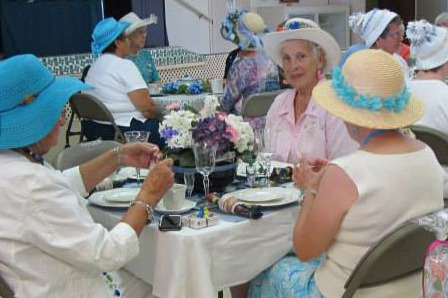 Enjoy bingo, potluck dinners, shuffleboard and our new clubhouse with satellite TV, pool table and games. Large cement slabs and picnic tables available. Are you looking for that very "Special Place" to spend time having fun, relaxing at the beach, playing golf, enjoying life? 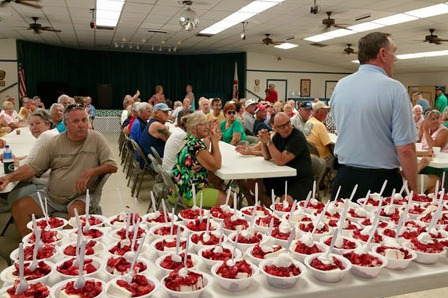 You've found it located adjacent to Tamiami Village in N. Fort Myers across from the Shell Factory. Our RV guests enjoy the fun and activities sponsored by Village Groups.